Every night at 10, Kolkata tunes into Big FM to listen to ‘Kuch Bheege Alfaaz’ – an episodic series of unrequited love stories hosted by RJ Alfaaz who, despite his tremendous following, prefers staying detached and anonymous. Among his many fans is the boisterous Archana, a girl working at a creative agency – which designs branded memes. She is leukodermic but lives life to the fullest. 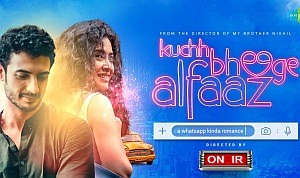 They meet; or rather talk, for the first time over a misplaced call, when Archana accidentally dials Alfaaz’s number, while trying to connect with her latest blind date. A friendship blossoms between the two strangers hidden behind their digital screens. It quickly translates in to a whirlwind of romance, until they bare their true selves to each other.